Last week, during the Milan International Furniture Fair, French maison Hermès presented its latest home collection, which is all about colour. Objects, home textiles, furniture, wallpaper and the like were displayed in a structured space designed by Charlotte Macaux Perelman, Hermès’ deputy artistic director. Hermès’ home collection launches at the annual furniture fair have always been impressive, to say the least. But the 2018 edition might just be our favourite one yet. One hundred and fifty thousand (yes 150,000) zellige tiles were imported from Morocco to form the structures that acted as colourful canvases for its new home products. 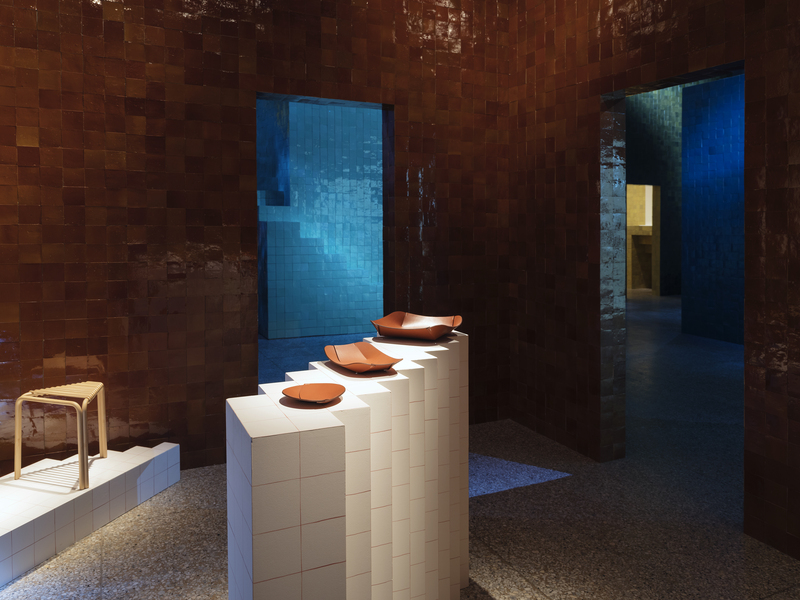 It took three weeks for the team to complete the seven tiled pavilions, each of which housed a specific set of items. One held geometric, patterned tableware in varying sizes. Dubbed Périmètre (pictured, below), these porcelain vases and trays were inspired by bricks, louvres and palisades, and colourfully rendered in a variety of hues. Alongside these products were plates for breads, desserts and of course, dinners. Hèrmes called this collection A Walk in the Garden, inspired by the English gardens of old where flowers bloomed and conversations flourished. Once again, bright colours took centre stage. Another room displayed colourful blankets constructed from cashmere or a cashmere-and-merino mix, hanging just besides a collection of the brand’s small home items for the desk. There were storage boxes for accessories and watches, alongside a bust for hanging necklaces and a scarf box. The home collection also paid tribute to Hèrmes’ equestrian heritage (pictured below). Supple and robust bridle leather were shaped into pencil, pen and card holders with minimal cuts and with four saddle stitches in white linen thread, paying homage to the horses that made the French luxury house become what it is today. One of the rare luxury brands that wants its customers to buy less and that has no brand ambassadors, Hèrmes has always stated time and again that its only concern is producing high quality products. The brand is nonchalant about fleeting trends and market forces. The brand moves at its own pace and creates items that people covet, not because they are expensive but because they are, more often than not, beautiful and timeless. The new Hèrmes home collection certainly possesses those two qualities. In a luxury world that is besotted with manic consumption, Hèrmes is a welcome anomaly.